There is simply ourselves and where we are has a particularity which we'd better use because that's about all we got. . . the literal essence and exactitude of your own. I mean the streets you live on, the clothes you wear, or the color of your own hair. 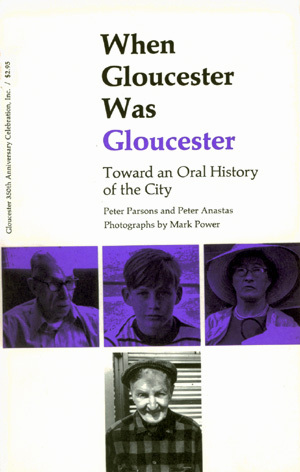 This book was compiled from many hours of tape-recorded conversations with Gloucester people who either volunteered to talk about their lives or were contacted by Peter and myself and asked to do so. We asked them questions like, "What do you remember most about growing up in Gloucester?" and "Do you have any Gloucester dreams?" and generally encouraged them to talk about whatever they felt moved to talk about. The tapes were edited as narratives by removing the questions and linking together the stories and statements. Not one word of the original was changed. Occasionally the order of the material as it occurred in the space of the interview was changed to facilitate chronology or narrative impact. We used pseudonyms for the men in the first interview ("Unloading the Holy Family at Empire Fisheries") at their own request, but the rest of the people's names are their own. My own sense at the completion of the book — really just a stopping place, for we don't consider this work either complete or definitive — is of enormous humility before so much lived experience, so much human feeling. And, even more especially, of the preciousness of each life as it unfolds in these pages and daily in the streets and homes of the city of Gloucester and has since 1623. Finally, my hope is that this book will be just a beginning, that others will be moved to enter the process, to become not only historians of the spoken history of a remarkable place and her people, but in a more real sense, historians of themselves. I remember being anxious about starting this project — as if I didn't know that the stories were really there. Killing time at the D.P.W. Mug ups. Marty Carr dead! Down the foc'sles. People can and do speak their minds here. Especially working. Anyone who puts in time working here knows that. My confidence in doing the book this way came from knowing that people talk in Gloucester. And I'm also most confident that what they have to say is usually more interesting face-to-face than what's been written about what people say. Or what writers think people sound like here. Everyone has a story in Gloucester. We thought at first we'd get "representative" people. We made long lists. Didn't work. It's mostly random. By word of mouth. "You know who you ought to talk to. . ."
Someone told me people don't talk to each other as much as they used to. Radio and television. And the automobile. And in Gloucester "its not what you know but who you know that counts." Politics. I don't know what's going to happen in the next 350 years if people don't talk to each other as much as they used to. Paul Lundberg told me I have the "gift of gab — just like your mother." I like that. That will stand for my part in this. Published by the Gloucester 350th Anniversary Celebration, Inc.